My whole life depends on it. Okay, I have some bad news. We’re all traveling through time together, every day of our lives. All we can do is do our best to relish this remarkable ride. I love your eyes, I love the rest of your face,too. I haven't even looked further down and I'm sure it's all fantastic. 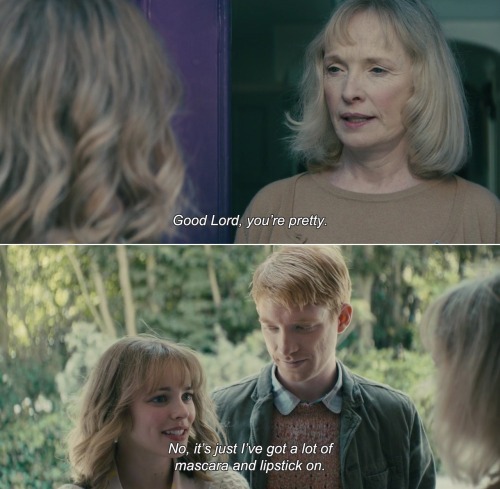 Mum: Good Lord, you’re pretty. Mary: No, it’s just I’ve got a lot of mascara and lipstick on. Mary: I’m gonna go into the bedroom and put on my new pyjamas. And then in a minute you can come in and take them off. Bed and breakfast in Scotland. I am not taking my pants off for Scotland. Tim: And in the end I think I've learned the final lesson from my travels in time; and I've even gone one step further than my father did: The truth is I now don't travel back at all, not even for the day, I just try to live every day as if I've deliberately come back to this one day, to enjoy it, as if it was the full final day of my extraordinary, ordinary life. Kit Kat: Maybe, just maybe, I'm the faller. every family has someone who falls, who doesn't make the grade, who stumbles, who life trips up. Maybe I'm our faller. Tim: And so he told me his secret formula for happiness. Part one of the two part plan was that I should just get on with ordinary life, living it day by day, like anyone else. Tim: But then came part two of Dad's plan. He told me to live every day again almost exactly the same. The first time with all the tensions and worries that stop us noticing how sweet the world can be, but the second time noticing. Okay, Dad. Let's give it a go. Tim: There's a song by Baz Luhrmann called Sunscreen. He says worrying about the future is as effective as trying to solve an algebra equation by chewing bubble gum. The real troubles in your life will always be things that never crossed your worried mind. Mary: I'm going to go into the bedroom and put on my new pajamas, and in a minute you can come in and take them off.